Is your little one starting to pull themselves up on the furniture? Have they taken their first tentative steps and now always want to be on the go? 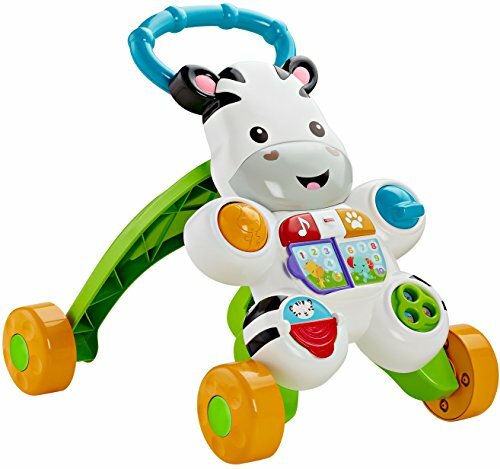 Now’s the time to look for the best push toys for babies and toddlers. This could be the solution to help them perfect their walking skills. Rather than being restricted to the furniture they can navigate around, a push toy can help them bridge the gap. My little ones loved to push a cart full of wooden blocks around. Let’s look at the benefits of push toys, and review our top 21 picks. Use the links above to check the latest prices or read our in-depth push toy reviews below. Push toys can help your baby develop important skills, like balance, strength, and coordination. Not only will it help them learn to walk, but they’ll become more confident in their walking abilities (source). You can start with push toys which are sturdy to help baby stand. They’ll teeter along behind it as they find their feet. They might need some help from you at first – and a nice cushioned diaper for all those times they fall back on their bottom! Stand your baby up and place their hands on the push-along bar. Practice will make perfect and they’ll soon be off scooting around the home on their own. 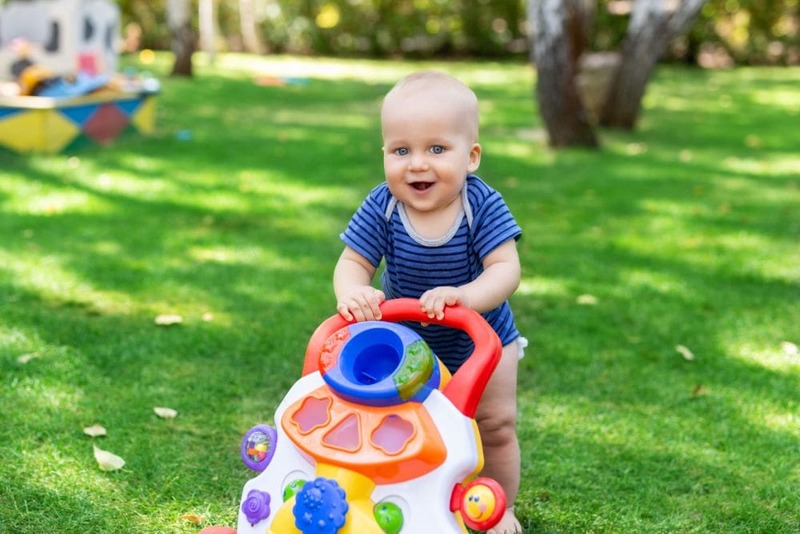 Many push toys resemble items that your baby sees you pushing around, such as shopping carts, lawn mowers or vacuums. They’ll love to think they are helping — these toys fuel their imagination and stimulate fantasy play. Many also have educational or stimulating toys built in. It might be counting games, songs, noises, shape sorters, building blocks, and more. Push toys are great to help babies learn to walk, but they need to be suitable for their age. Giving your baby a push toy that is not age-appropriate might frustrate them. They might pull themselves up, but the baby walker is too heavy for them to push. It’s a slow progression from standing, to walking and pushing. Maybe start with a push toy that doubles as a ride-on. They can use their legs to scoot along and progress to pushing it when their legs strengthen and coordinate. Be ready to pick them up when they fall and give them a reassuring cuddle. At about 15 months old your toddler might be confident and strong enough to push along a sturdy toy with wheels. From around 18 months they’ll push a toy, like a broom or a vacuum, along the floor. By the age of 2, your toddler will likely have mastered the art of pushing and pulling toys. This is when you need eyes in the back of your head since there’ll be no stopping them! Apart from being age appropriate, there are a few other considerations when choosing a push toy. Height: Make sure it’s not too short or too tall for your baby. Take the height and width into account when choosing your push toy. Sturdiness: You don’t want it falling over on your little one as they try to pull themselves up. 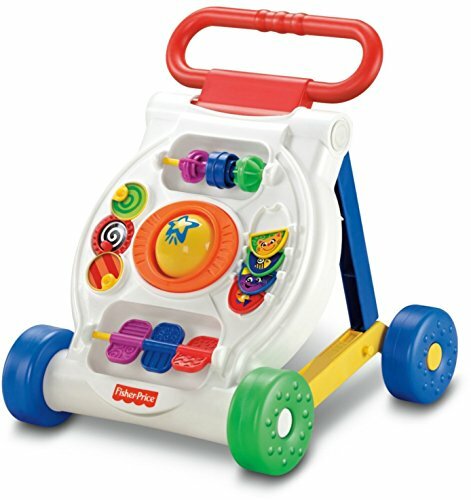 Wheels: Check what the wheels are made from and how easy or hard it might be to push the toy across your floor. Carpet will offer more resistance than hard flooring. Brakes: Some toys have a brake, or the wheels can be adjusted to limit the speed. Now we know what the benefits of push toys are and what to look for, let’s check out what we think are the 21 best push toys for walker development. 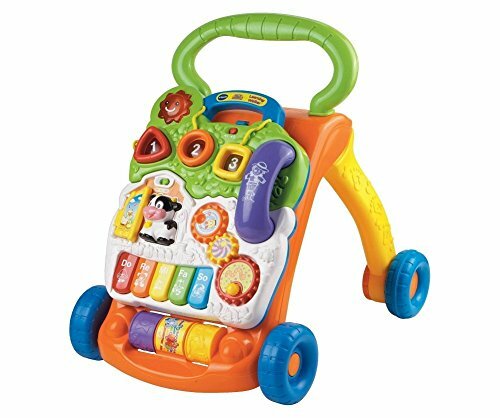 Babies can use this baby push walker even before they take their first steps. It’s suitable for ages 9 months to 3 years. It has a removable activity panel with a shape sorter, piano keys, telephone, lights, sounds, and spinners. What’s even better is that the 70 different songs and sounds can be volume controlled. You can bet you’ll want to turn the noise down after a while. Time to walk? Re-attach the activity center and the sturdy frame will let the baby pull themselves up and push the toy. The rubber coated plastic wheels work on carpet or hard flooring and have adjustable speed. This classic option has gone through different designs for about 100 years. The resist-push feature lets your baby build up their balance and confidence. As they progress, they can fill the middle with toys to push around with them. 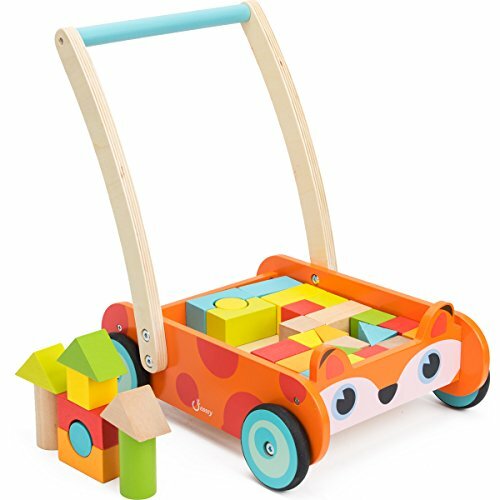 The wheels push in a straight line to keep baby on track, and there’s a bumper which protects your furniture from damage. The wooden sides are removable which could be an issue if your little one likes climbing. This walker is suitable from ages 1 to 4 years. Get your little one started learning about numbers and the alphabet as early as 6 months old. 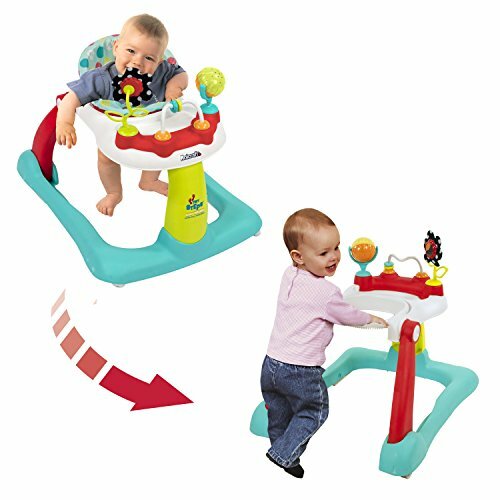 This two-in-one push toy has a fabulous activity center to keep baby engaged when sitting and playing. It’s no problem when they’re ready to walk — they can just pull themselves up and push along, with encouragement from the zebra. The easy-grasp handle and wide wheelbase will help your baby with their first steps into the world of walking. Light-up buttons, a book whose pages turn, balls to spin and dials to twist all add to the fun. Music and educational ABC and 123 songs complete the package. This is a drawing table, a games center for baby and a push toy for walking, all in one. Start them off on the games center. They can drive with the steering wheel, answer the phone, slide the rattle beads and so much more. When they begin to explore, the triangular walker design with adjustable speed will give them stability. Easily change the frame to form legs and reveal the drawing board to fuel their inner artist. I like that this can be used from 6 months upward, with lots of activities to keep little ones interested. An old-school style baby walker, this one is made from organic rubberwood which has been recycled. Suitable for babies aged 10 months to 3 years, the handle can be adjusted as they grow. It comes with 24 wooden blocks in different colors for baby to play with. The wheels can be adjusted, to either slow down or speed up the walker. Keep the tension tight when your little one is learning to walk, and then start releasing it as they gain confidence. A walker without wheels, yes you read that right! This wooden walker is like a small table in shape and has spring-loaded feet. When your baby wants to pull themselves up, it doesn’t roll away from them or restrict their movement. They can easily move from knees to feet and then push the table around the room. The table’s feet allow it to move steadily and slowly, which is great for babies just starting to walk. 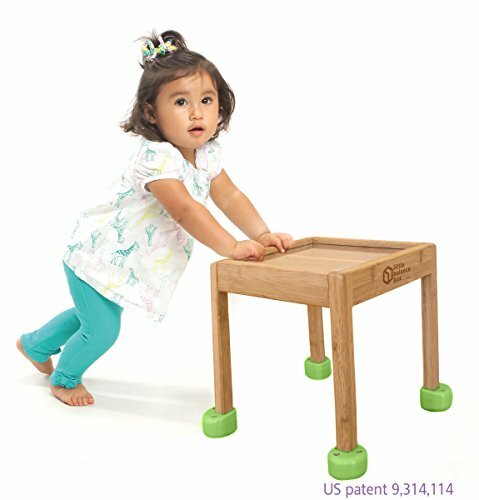 It moves on any floor surface and when not being used as a walker, doubles as an activity table. Imagine the world from your toddler’s perspective. They come to the store with you and sit in the shopping cart while you push it around. Now they can have their own for make-believe play. Suitable from 2 years upwards, the cart has a seat in the shopping basket, just like the ones at the store. 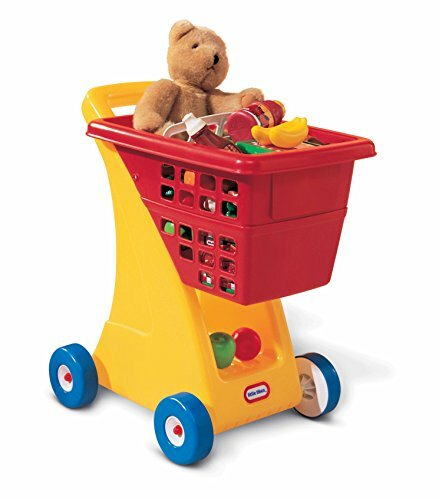 Add some play food items and a favorite doll or teddy, and your toddler will have loads of shopping fun. There’s even a secret storage area beneath the basket for your little one to hide their treasures. From about 6 months, your baby can sit and play with the detachable cooktop activity center on this push toy. 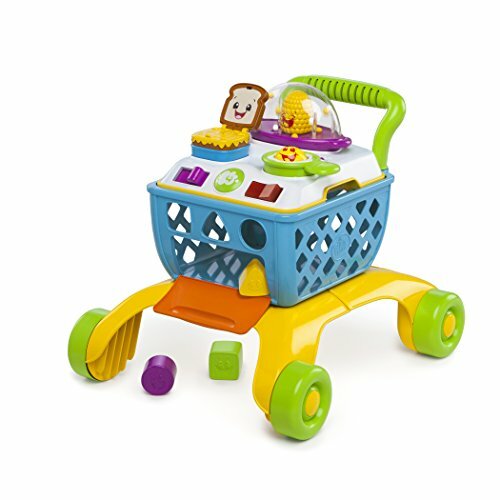 There’s a sliding lever to pop the sandwich up, a button to push for cooking sounds and a spinning “egg roller.” Once they can stand, the lockable wheels allow it to become a stationary play table. The wide base wheels can be unlocked when your baby starts to walk. They can then use the shopping cart design to collect toys and other items, just like Mom at the store. The plastic wheels might work better on carpet than hardwood floors. This push/ride toy provides three-in-one action for your little one. They can sit in front of the lion and play with the many activities, including letters and numbers. 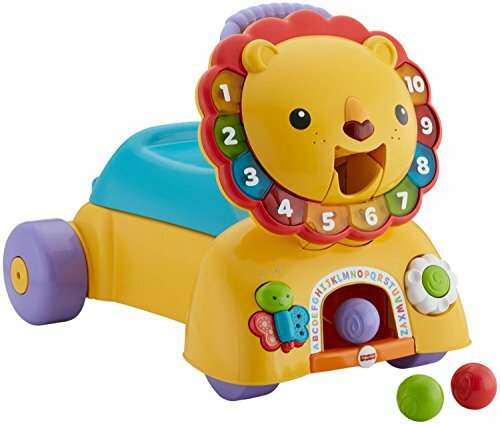 Feed the lion by putting balls in its mouth which then pop out below while it talks to your child. Once your baby starts walking, the seat becomes a handle to push along and, when they’re ready, a sit and ride. Mr. Lion will sing some songs and give encouraging remarks while they move. The wheels don’t lock, so supervision is necessary once your baby starts trying to pull themselves up. 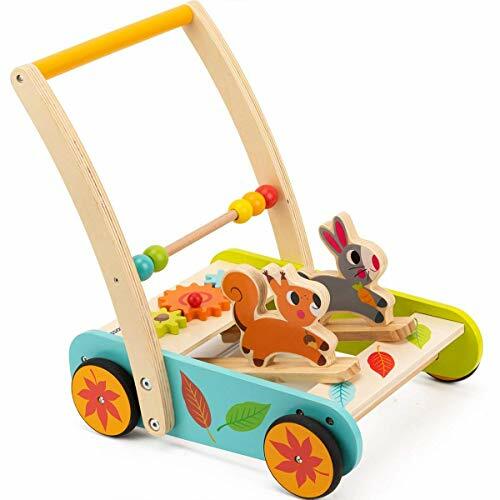 This baby walker includes a cute wooden squirrel and bunny to encourage your child to push this toy. 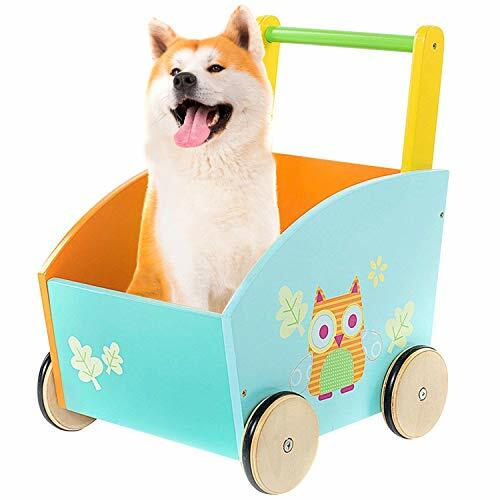 When the cart moves, the animals appear to run along, making a soft clacking noise which babies will love. It’s suitable for children aged 1 year or older. The handle can be fitted traditionally for older toddlers who are already walking. If your baby is just finding his/her feet, then reverse it for more stability. Handcrafted from top quality Dutch wood, the water-based paint used is safe for babies. Thermoplastic wheels save your hardwood floors from damage. 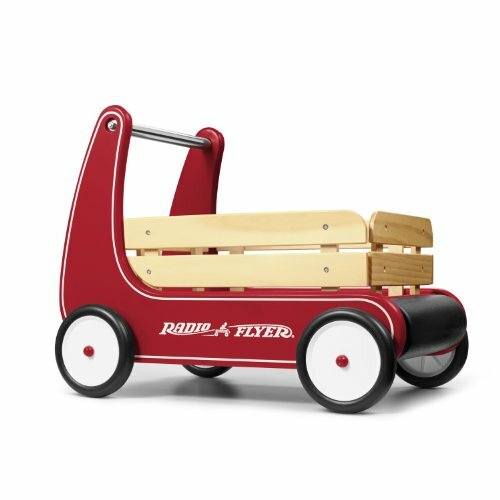 Aimed at the slightly older walker, aged 3 years and up, this push-and-pull wagon can be filled with goodies to move around. Let them help you move things in the yard, or take their teddies out with you for a walk around the park. Maybe they can use it to clear up their toys at the end of the day. 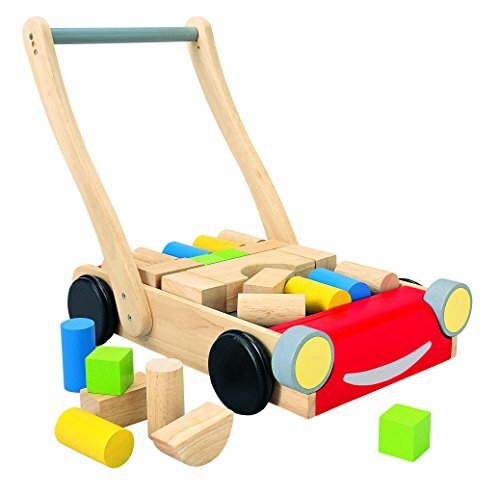 The sturdy wooden construction is designed for stability and all materials are safe for your child. The handle can be released to allow your little one to pull the wagon along or locked into place for pushing. 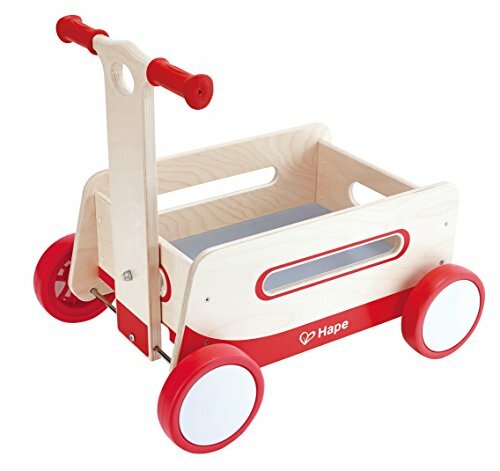 Hape brings us a sturdy wooden push and pull for little ones aged 12 months to 3 years. Built into the cart are gears for turning and balls for spinning. The handle incorporates sliding knobs to add to the fun. The wood is sourced from sustainable forests and painted with bright, non-toxic colors. The rubber-trimmed wheels will protect floors while your toddler pushes this around. Sturdy enough for pull up, the base also has storage for your toddler to take teddies along for the ride. I love that this walker can accommodate babies from 15 pounds who can hold their heads up and are trying to support themselves on their legs. The adjustable seat lets them sit and play, or walk along while supported. Once they’re ready to pull themselves up and walk, it converts to a push toy. Activities including a flower mirror with crinkly petals, a bead bar, and a spinning ball, to keep your baby entertained and develop fine motor skills. The wheels cannot be locked for speed, but the walker can be folded flat for storage. This push toy can start folded as an activity center for your baby, where they can sit and play. 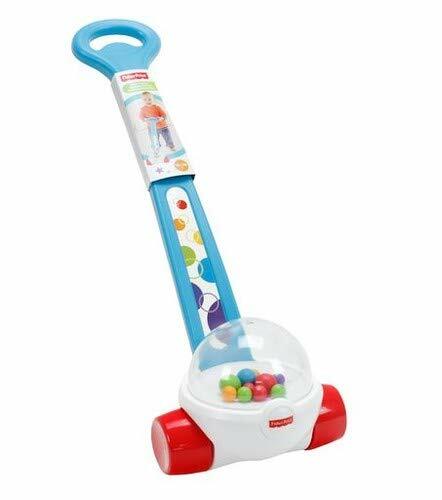 It has colorful sliding, spinning beads, flipping doors, turning gears, and a large roller ball. When your little one is ready, unfold the handle and let them pull themselves up and steady themselves as they walk along. The easy-grasp handle and wide wheels will have them zooming around in no time, giving them hours of play and walking fun. Kids love to help, and there’s nothing better than being able to mow the lawn alongside mom or dad. 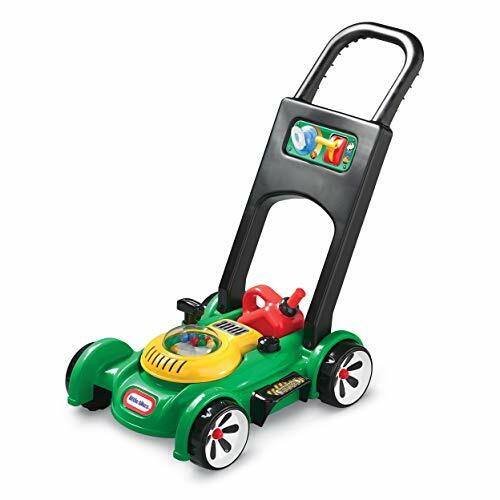 Suitable from 18 months, this Little Tikes mower will encourage your toddler to walk around the yard. It has a pull cord with an engine sound, popping beads which make a noise as your little one mows, a movable throttle, and clicking key. There’s even a removable gas can for filling with fuel. I love that all the sounds are mechanical so no need to worry about batteries running out. 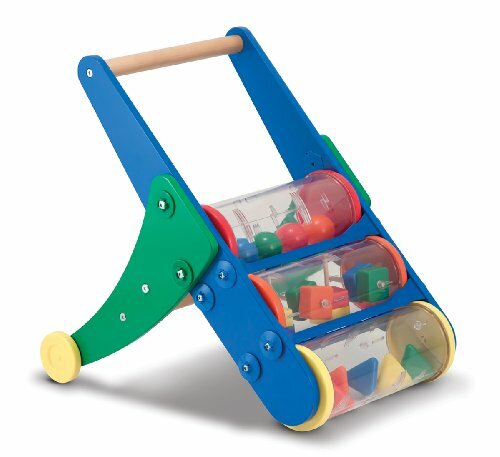 Three shape-and-ball filled cylinders tumble and rattle as your child pushes this toy along. 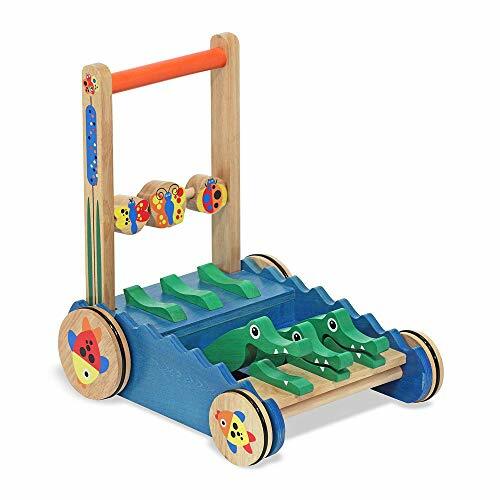 Brightly colored and made of hand-sanded wood, it’s sure to keep them amused as they push or pull it. It will appeal whether your baby is 12 months or 2 years old. This sturdy push toy will let your little one pull themselves up and begin walking around the home. Just be careful, as it will move faster on wooden or tile floors than on carpet and can’t be adjusted for speed. 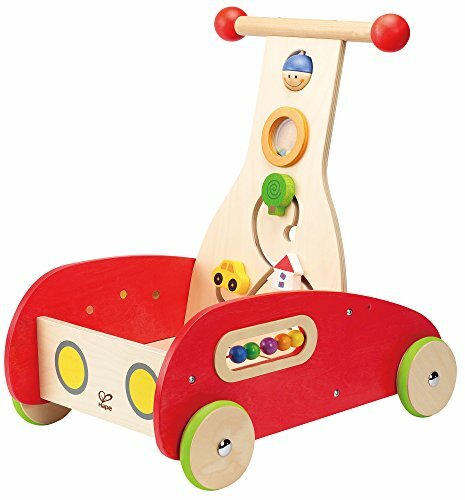 With an eye-catching orange owl design painted on the side, this wooden walker is suitable for children between 1 and 3 years old. The sturdy cart has non-slip wheels which can be easily maneuvered. 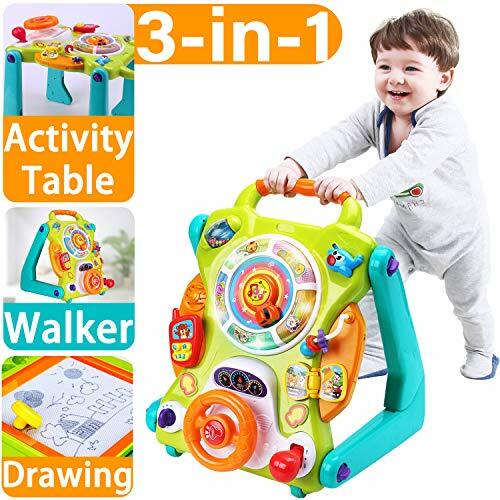 Fill the walker with baby’s favorite toys and let them walk them around. When they get tired, they can sit down, take the toys out and play with them. The broad base will let your baby pull themselves back up when they’re ready to walk again. 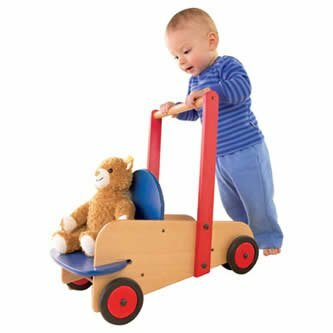 This simple wooden walker is an ideal starting place for your baby, from about 10 months old when they’re ready to start exploring. The sturdiness lets your little one pull themselves up, and the rubber wheels can be adjusted for speed. It’s suitable for use on carpet or hard floor surfaces. There is a seat for your toddler to sit their favorite doll or teddy on, and storage space for other toys. This walker can also be used outdoors. Is your little one into construction, and loves building? If so, this could be a good push toy choice for them. The walker comes with 34 wooden building blocks for your toddler to sit and build with, when they’ve had enough of walking. Suitable for children from 12 months, the friction-resistant wheels will slow them down when necessary. They’re also rubber trimmed so won’t scratch your hardwood floors. This is one I remember from my early years, as well as those of my kids. Its simplicity has stood the test of time, with balls that pop and make a noise as it’s pushed along. The faster your little one goes, the quicker they pop and the more noise they make. The clear glass dome lets the little ones follow their movement, helping baby to learn cause and effect and encouraging them to walk. Three alligators sitting in a swamp are the centerpiece of this push toy, suitable for children aged 12 months and over. As the toy is pushed along, the gators open their mouths and make a clacking noise. This encourages your little one to walk while holding the sturdy handle. It has a hardwood construction, with rubber-coated wheels. Non-toxic paints make it safe for little humans. Three spinning ladybugs and butterflies on the back of the toy help to keep enquiring minds amused. The speed cannot be adjusted, so take care when your baby first starts walking, especially on hard floors. Push toys and baby walkers are great for baby’s development in many ways. They help with walking, strength, and balance and incorporate many activities for learning and fine motor skills. My vote for the best baby push toy goes to the VTech Sit-to-Stand. It has lots of activities, is stable and speed-adjustable. It can also be used as an activity center from the time baby can sit. We hope you enjoyed our top picks of the best push toys for babies and toddlers. Please leave us a comment, and don’t forget to share.